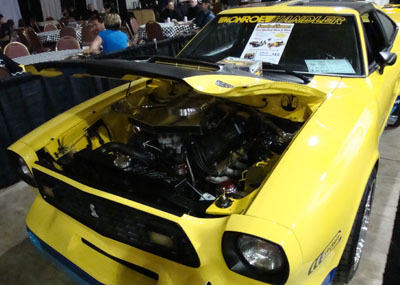 Ever heard of a 1978 Monroe Handler Mustang ? It was a cool looking project car featured on the June 1977 cover of HOT ROD Magazine. I recently had the pleasure of seeing one of these rare 1978 Mustangs at the BC Classic & Custom Car Show. the pictures you see are from that show. Beginning life as a Mustang Cobra, the original Handler's concept started with a winning sketch which was merged with additions by the likes of Harry Bradley, Tod Gerstenburger and Harry Weeks. * Creative Car Craft's Dave Kent, well known at the time for his Kent Racing team, and race car projects with Dan Gurney. CCC's prototyping shop created the wild styling and body kit for the project. "a full-boogie poke 'n' stroke number with just enough off-the-shelf parts to make the "now" 363-inch, thin-wall Hank a relatively reasonable answer to those who would like to do the same and turn their own mounts into the torque of the town". The Monroe shock company. Munroe Handlers were the Munroe company's new street performance air shocks. Although the original concept was a street/race ready car, Monroe later commissioned Kent to produce 6 more reproductions which were featured in shows and marketing campaigns. BF Goodrich was the tire maker of choice for the project, providing huge BFGoodrich T/A Radial tires. /b>Centerline Wheels. A set of the very popular 14" Centerline wheels were added to the front and rear. Other sponsors included Revell (model kits)and Motorola ( high fidelity 8 track stereo). Dave Kent and the folks at Creative Car Craft /b>designed an IMSA inspired body shape, combining race circuit styling with additional room for wider wheels and tires and a lowered suspension. Not satisfied with a one-off project, Dave decided to pull molds from his prototype fiberglass body kit and sell them as a kit for the Mustang ll, which he called the Handler ll. The final product in Monroe form, included a two tone paint treatment, stripes and a bevy of sponsor stickers. But shocks alone were not going to make the car handle like a race car. So with the body panels finished, it was taken to Trevor Harris (Harris Dynamics) in Costa Mesa, California. Trevor designed and built suspensions for the famous BRE (Brock Racing Engine) Datsuns (Nissan)that were responsible for winning a number of Trans-Am and SCCA national titles. The suspension setup started with the addition of stock offset 14" Centerline eight-inch front and nine-inch rear Street Disc wheels. Mated to these wider than stock wheels were some beefy GR50-14 BFGoodrich T/A Radial tires. This combination, combined with new custom-wound 180 pound per inch coil springs at the front lowered the front end by 2 1/2 inches. At the rear, a new l1 1/2 inch shorter leaf spring shackle was fabricated, which combined with the new wheels and lower profile tire, dropped the rear end to its desired height. A new rear leaf was substituted to further improve handling. A new stiffer sway bar was designed to fit inside modified stock mounts to look stock but create increased roll stiffness and dramatically decrease the roll angle. The Monroe handler series HP4866 shocks were used in the front end and some HP4966 units were substituted for the rear. The Monroe Handler Mustang engine was a heavily massaged Windsor V8, which was punched out to 363 cubic inches by Jack Roush. The engine was blueprinted. Heads included TRW valves, anti pump up lifters and the heads were ported and polished. The block was treated to Boss 302 forged steel rods, a modified cast nodular 351 Cleveland "stroker" crank and flattop BRC forged aluminum pistons. The cam was a mild Ford Racing grind topped by a performance intake manifold and a holley 750 double-pumper. Decked out, this engine put out an impressive 400 + horsepower and 400 pounds of torque.